Explore the seven critical competencies necessary for success in the 21st century. Become familiar with good habits of mind, and pass those habits on to students to support their soft skill development. Learn how to teach critical thinking and other 21st century skills by facilitating learning that will develop the critical competencies in students. Develop powerful and effective soft skill assessment methods, such as student self-assessments, that will test student levels of competency in the seven critical areas. Access free reproducibles to supplement your understanding of the text and facilitate the book’s content in the classroom. Bellanca, J. A. (Ed.). (2015). Deeper Learning: Beyond 21st Century Skills. Bloomington, IN: Solution Tree Press. Bellanca, J. A., & Brandt, R. (Eds.). (2010). 21st Century Skills: Rethinking How Students Learn. Bloomington, IN: Solution Tree Press. Bellanca, J. A., Fogarty, R. J., & Pete, B. M. (2012). 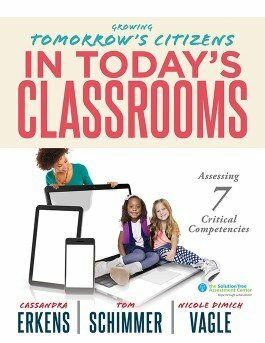 How to Teach Thinking Skills Within the Common Core: 7 Key Student Proficiencies of the New National Standards. Bloomington, IN: Solution Tree Press. Buffum, A., Mattos, M., Weber, C., & Hierck, T. (2015). Uniting Academic and Behavior Interventions: Solving the Skill or Will Dilemma. Bloomington, IN: Solution Tree Press. Depka, E. (2017). Raising the Rigor: Effective Questioning Strategies and Techniques for the Classroom. Bloomington, IN: Solution Tree Press. Erkens, C. (2016). Collaborative Common Assessments: Teamwork. Instruction. Results. Bloomington, IN: Solution Tree Press. Erkens, C., Schimmer, T., & Vagle, N. D. (2017). Essential Assessment: Six Tenets for Bringing Hope, Efficacy, and Achievement to the Classroom. Bloomington, IN: Solution Tree Press. Fisher, D., Frey, N., & Lapp, D. (2012). Teaching Students to Read Like Detectives: Comprehending, Analyzing, and Discussing Text. Bloomington, IN: Solution Tree Press. Guskey, T. R. (2015). On Your Mark: Challenging the Conventions of Grading and Reporting. Bloomington, IN: Solution Tree Press. Jacobs, H. H. (Ed.). (2014). Leading the New Literacies. Bloomington, IN: Solution Tree Press. McLeod, S., & Shareski, D. (2018). Different Schools for a Different World. Bloomington, IN: Solution Tree Press. Reeves, D., & Reeves, B. (2017). The Myth of the Muse: Supporting Virtues That Inspire Creativity. Bloomington, IN: Solution Tree Press. Weber, C. (2018). Behavior: The Forgotten Curriculum—An RTI Approach for Nurturing Essential Life Skills. Bloomington, IN: Solution Tree Press. Wiliam, D. (2018). Embedded Formative Assessment (2nd ed.). Bloomington, IN: Solution Tree Press. Zhao, Y. (2016). Counting What Counts: Reframing Education Outcomes. Bloomington, IN: Solution Tree Press.